Get out there with the Men's Cloudventure trail running shoe by On. Featuring a Grip-Rubber profile, the Cloudventure attacks every rock with four unique, micro-engineered grip-rubber surfaces. 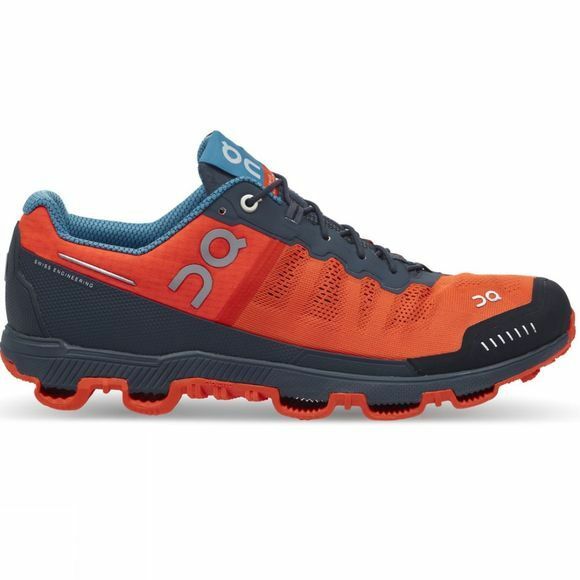 Inspired by adventurous running in the Swiss Alps, the Cloudventure has a light and adaptive 2-layer upper which supports a fast ascent. The top layer is breathable and water repellent, whilst the inside layer is comfortable and supportive. The patented CloudTec cushioning uses horizontal and vertical cushioning "Clouds" for firm yet soft landing support and an explosive take-off.